The Amazon Cloud offers a range of services for dynamically scaling your own server-based services, including the Elastic Compute Cloud (EC2), which is the core service, various storage offerings, load balancers, and DNS. It makes sense to control these via the web front end if you only manage a few services and the configuration rarely changes. The command-line tool, which is available from Amazon for free, is better suited for more complex setups. If you want to write your own scripts to control your own cloud infrastructure, however, Boto provides an alternative in the form of an extensive Python module that largely covers the Amazon API. As you can see, the EC2Connection function expects two keys that you can manage via Amazon Identity and Access Management (IAM). 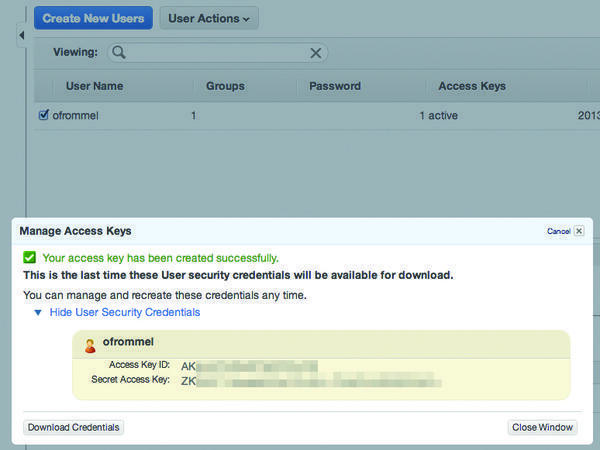 In the Users section of the IAM Management Console, you can go to User Actions and select Manage Access Keys to generate a new passkey (Figure 1). Figure 1: Amazon Identity and Access Management (IAM) is used to generate the access credentials needed to use the web service. The key is immediately ready for downloading but disappears later for security reasons. In other words, you want to download the CSV file and store it in a safe place where you can find it again even six months later. Thanks to the connection object, users can typically use all the features a service provides. In the case of EC2, this equates to starting an instance, which is similar to a virtual machine. To do this, you need an image (AMI) containing the data for the operating system. Amazon itself offers a number of images, including free systems as well as commercial offerings, such as Windows Server or Red Hat Enterprise Linux. Depending on the license, use is billed at a correspondingly higher hourly rate. If you take a look at the EC2 front end, you can see the instance launch (Figure 2). Figure 2: The web console: The Boto script starts new instances of an image. That’s it basically; you can now use the newly created virtual server. Amazon points out that users themselves are responsible for ensuring that the selected instance type and the AMI match. The cloud provider does not perform any checks. To stop an instance you have started, it would be useful to have direct access to it in Boto. This access can be achieved by storing the return value for the above call in a variable: run_instances() returns a reservation containing an array field named instances that stores all the concurrently started instances. Listing 1 shows the complete script for starting and stopping an instance. The instance object’s tags attribute then stores the tags as a dictionary. If you add a few lines, like those in Listing 2, to a script, you can call the script with python -i . To save yourself the trouble of repeatedly typing the region and the authentication information, Boto gives you the option of storing these variables in a configuration file, either for each user as ~/.boto or globally as /etc/boto.cfg . The configuration file is divided into sections that usually correspond to a specific Amazon service. Access credentials are stored in the Credentials section, which is not really convenient, because in addition to the region, the user also needs to enter the matching endpoint; however, you only need to do this work the first time. You can retrieve the required data (e.g., as in Listing 3). A complete configuration file containing a region, an endpoint, and access credentials is shown in Listing 4. As mentioned before, the regional data is service specific; after all, you want to run the services in different regions. The region for EC2 in this example is thus ec2_<region_name> , whereas the S3 storage service uses s3_<region_name> , and the load balancer uses elb_<region_name> , and so on. The API is a little confusing because some functions are assigned to individual services and can be found in the matching Python modules, whereas others with the same tasks are located in the boto module as partially static functions. For example, to set up a connection, you have boto.ec2.connect_to_region() and boto.connect_ec2() . Although boto.connect_s3 follows the same pattern, the corresponding call in the S3 module is named S3Connection . The API documentation provides all the details. Alternatively, you can use the Autoscaling module that automatically adds nodes to the load balancer or removes them depending on the load. Of course, you can always install a MySQL, PostgreSQL, or NoSQL database on a number of instances of Linux and replicate it on other PCs. For load distribution, you would then use the load balancing service, possibly in cooperation with the Amazon CloudFront content delivery network. When it comes to managing your own cloud installation, you have too many choices, rather than too few. In addition to autoscaling, your options include Elastic Beanstalk, OpsWorks, and Cloud Formation, all of which offer similar features. This list of services, however, is not complete; the PDF on Amazon’s website provides an overview. Boto lets you write scripts that manage complex setups in the Amazon Cloud. Even if you’re not a Python expert, you should have little difficulty acquiring the necessary knowledge. The documentation for the Python module is usable, although many of the API’s methods are fairly complex, with their multitude of parameters. Finally, don’t forget that cloud computing frameworks already provide some of the functionality that you can program with Boto, so take care not to reinvent the wheel. More information about Boto can be found in the documentation. In printed form, check out the Python and AWS Cookbook , which is also by the Boto author.